A couple weeks ago a wine sample arrived at my door. This is a fairly common occurrence here but I was intrigued to see it was a single bottle from Crushpad. 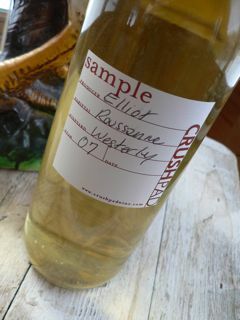 Could this be my first barrel sample of our open-source Roussanne, I wondered? Yes, it was! Being near zero Fahrenheit outside the bottle was too cold to allow for tasting until the wine warmed up, so it sat on my desk for the rest of the day. The anticipation of tasting my first effort at non-home winemaking got the better of me later in the day and I poured out a sample… would this wine measure up to my expectations or would I be disapointed? For a few moments, I thought the latter after sticking my nose in the glass and picking up SO2 along with fruit. After several minutes of vigorous aeration this aroma lifted, most likely due to a freshly sterilized bottle. I then was quite pleased to find a classically aromatic Roussanne with the characteristic waxy honeysuckle, stone fruit and ripe pineapple. The color at this stage is a lemon-yellow which tells you we have been aging the wine in oak. But there is no aromatic or flavor component from the oak as we have used neutral barrels. The flavors are also what I expected with lean citrus and tropical fruit finishing very clean with good acidity. Overall, a very nice young wine that I look forward to see what happens with as we continue to stir lees and later blend with Marsanne and Viognier. Members of my Crushnet group will have a chance to taste the wine late next month when I will be hosting a barrel tasting and blending party at Crushpad in San Francisco. We’ll also talk about naming and branding as labels will need to be prepared soon to ensure TTB approvals and printing. If you are interested in buying some of this wine, join my group at Crushpad. Sometime in May I will close membership, so time is running out to get your hands on what looks to be a stunning $18 Cali Rhone blend.